FREDERICK – In 1976, the School Sister of Notre Dame’s Baltimore province allowed, for the first time, sisters to request their placements. Sister Margaret Bauer’s first choice was to teach in Frederick at St. John the Evangelist’s elementary school. Her wish was granted. After teaching third grade for 17 years at what is now St. John Regional Catholic School, she took over the parish’s health care ministry to nursing homes and the local hospital, a position she still holds. Two years later, in 1995, the remaining teaching sister retired. 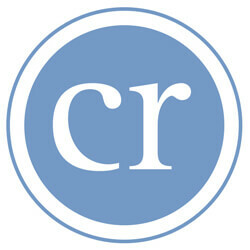 Sister Margaret is the only remaining member of her order in Frederick County. 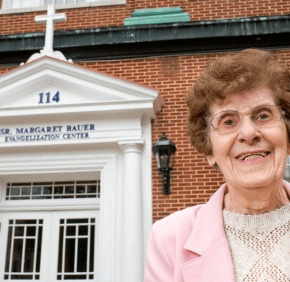 On Sept. 21, the parish celebrated her order’s contributions – and Sister Margaret’s unique status – by renaming its renovated former school building the Sister Margaret Bauer Evangelization Center. Sister Margaret grew up in New Jersey and entered the School Sisters in 1938. In the Archdiocese of Baltimore, she taught at St. Andrew, Blessed Sacrament and St. Matthew in Baltimore, and was principal at St. Joseph in Midland. She also taught elsewhere in Maryland, New York and Pennsylvania. In Frederick, she lived with as many as a dozen other sisters in a building that now holds parish offices. The Evangelization Center has a plaque with about 85 names commemorating School Sisters, now deceased, who’ve taught in Frederick. The first five School Sisters came at the request of St. John’s pastor in 1915. The Jesuits had founded a boys’ school there in 1829 but left in 1902, when the order transferred parish responsibility to archdiocesan priests. Lay teachers then staffed the school, which became co-educational, until the School Sisters arrived. Next door, the all-girls Visitation Academy, founded by the Sisters of Charity in 1824, was flourishing under the Visitation Sisters, but the pastor requested that all girls who were St. John parishioners transfer to the parish school to ensure its viability. The high school – St. John’s Literary Institution, now St. John’s Catholic Prep in Buckeystown – moved outside the city in 1958, and the School Sisters taught there until 1972. The elementary school remained on the downtown campus until moving to northern Frederick in 2001. According to a written history of the sisters’ work in Frederick, their contributions extended beyond the classroom. During World War I, their students sewed clothes for soldiers, and when 1919 influenza epidemic struck the city, they cared for the sick, including students at the nearby Maryland School for the Deaf. Being Frederick’s last School Sister is sad, Sister Margaret acknowledged, but she is looking forward to 2015, which marks a century since her order’s arrival in Frederick. The School Sisters have formed generations of Frederick Catholics, she said, and lay people continue the order’s work.